Over 400 students attended Chabad’s Spring Opener this past Tuesday night, which featured pop Israeli and Chassidic music, authentic shwarma in hot, whole wheat pita pockets, israeli salads, wings, hors devoures, sufganiot, and plenty of moctail l’chaims at the “Chabar” with Rabbi Goodman, Josh Roth, and Lev Gelfand, all under the watchful eye of professional bartender Josh Block! Special thanks goes to Tuesday night expert staff Danielle Wald, Jessica Loren, Matt Montel, Josh Strimber, Josh Block, and Lev Gelfand. It’s all because of your love and care that we have a crazy good Jewish community here at RU! Thanks for everything! 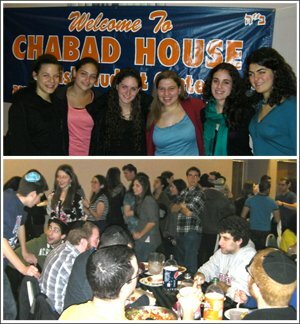 See you at the next exciting event at Chabad…because you know it’s good!